Welcome to the virtual lodge room of Orient Lodge. Orient is a Masonic lodge located in downtown Norwood, Massachusetts. Orient was chartered in 1861 by the Grand Lodge of Masons in Massachusetts and remains one of the largest lodges in the 6th Masonic district. Orient Lodge meets for our regular communication on the second Monday of the month during the Masonic year. Our dedicated members are involved in a wide variety of lodge and district events as well as community and charitable activities. 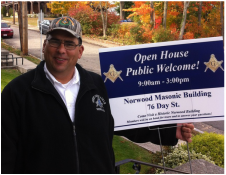 Orient Lodge meets in the Norwood Masonic Building located at 76 Day St. Our fabulous building is just as it was when it was built in 1916 and an integral part of Norwood history. Please browse our virtual lodge room and learn about Orient Lodge, our history and Freemasonry in Massachusetts. Please feel free to contact us through our contact page with questions, comments or membership inquires. And don't forget to follow us on Facebook and Twitter!